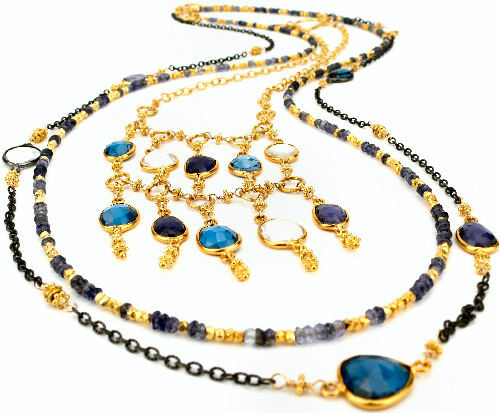 The latest trend is layering jewelry and here to tell us how is jewelry designer and style expert Robindira Unsworth. Pair leather with delicate chains, pearls and natural stones such as agate and drusy quartz for an organic vibe. Mix and match white gold, yellow gold, silver and oxidized silver to make stones stand out for a modern chic feel with an edge. A short chain adorned with a delicate charm layered with a strand of hammered metal beads and finished with a longer necklace embellished with richly colored stones instantly adds style to any outfit. Combine your stackable rings and bangles so that they are a unique mix of your own style. Try multiple variations to make your jewelry wardrobe work for you! Add a surprising layer or a pop of color for an unexpected look. Jewelry is an expression of your personal style, which means the more you experiment, the more comfortable you are with creating your own look.